9 Standard AC Series Air-cooled oil coolers provide high transfer rates. Dirty Environment ACD Models with non-louvered fins availble. Stainless Steel Braze Plate AKG/P Series Water-cooled oil cooler models available. TEFC Motor Fan Driven C Series oil coolers availble. Wide Selection of DC/DCS Model Series DC Motor Driven Fan Coolers including the new Bypass DC/DCS Models and the new Dual Fan DCS Series coolers with and without bypass. 10 Standard HC Series Air-cooled Hydraulic Motor Driven oil coolers available. Large Selection of C Series remote mount oil coolers including new Bypass C Series coolers. 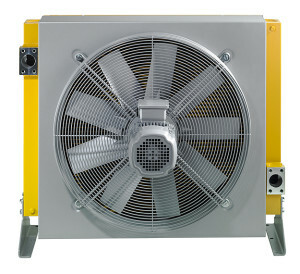 9 Standard CC Series Air-cooled after coolers available with either Eletric or Air motors. 9 Standard AOC Series Air-cooled Combination after cooler/oil cooler models available. Low Noise level models available. Stainless Steel Braze Plate AKG/P Series Water-cooled after cooler/oil cooler models available. 9 Standard AC Series Air-cooled Lube oil coolers available for rotary screw Air compressors. AKG CooL-Line is a standard line of products from the market leader in high performance industrial aluminium cooling systems. AKG is best known for its world-wide presence, German engineering and convincingly reliable product quality on the one hand and competitive prices on the other hand. The CooL-Line type series consist of different models for mobile and stationary applications and are available through our global specialist dealer network. This line of products embraces all-purpose complete cooling systems that comply with European or American Standards, is suited for normal or rugged environmental operating conditions, is powered by AC-, DC- or hydraulic motor- driven fans and is also available with noise optimized models. Capable of handling high flows and high viscosity fluids. Capable of high heat rejection (250 HP) at low oil flow (100 gpm). Capable of high heat rejection at low oil flow. Electric or Hydraulic motor options. Capable of 5000 to 7000 cfm with low approach temperatures and low pressure drop. Aftercooler capable of 2500 to 3500 cfm with low approach temperatures and low pressure drop. Cooler good for 500 to 600 HP compressors. Water Cooled AKG/P Series Brochure, SS Braze Plate, water-cooled models avail.